Our Sound Dome requires an amplified source. We recommend using our Mini Amplifier. 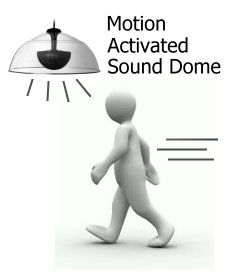 This is made specifically for our sound domes with only a 2 x 10 watt output. You can use your own stereo/amplifier, but our warranty will not cover blown speakers due to too much wattage. Patented Dual-Parabolic™ dispersion control technology provides a targeted audio footprint with true stereo separation. Twin 1.0 in concave aluminum high-excursion drivers in individually sealed compartments for stereo or mono music and messaging. 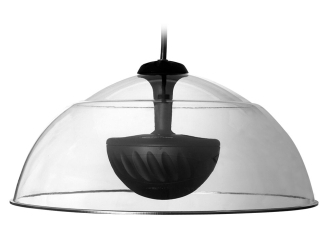 Patented ZeroReflection™ enclosure technology for accurate sound reproduction. Narrow 30º coverage angle for sharp focus. 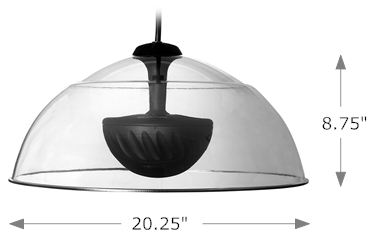 20.25 in custom-molded PETG clear polymer dome for minimal visual impact. User-selectable 350 Hz high-pass filter. Single-point balanced mounting for easy and clean-looking installs. Ships with clear dome, custom colors available. Included accessories: hanging bracket, mounting bushing and a 15-foot hanging cable which includes four 16-gauge inputs and a CAT V cable. Optional modules include motion sensor (FP-Motion) and LED light (FP-Light); optional 15-volt, 5-amp or 15-volt, 3-amp power supply necessary for all module accessories (AC-PS-1550 or AC-PS-1530). Optional electronic accessories include 10- and 20-watt transformers with junction box for 25-, 70.7- and 100-volt applications (AC-JB10-XFMR, AC-JB20-XFMR) and an external amplification unit with power supply (SA202-RDT) for use with any FP module. Ships as individual unit, bulk shipping available. also available for an up-charge.